Options analysis is an extremely versatile form of market analysis that provides investors with the means to pursue a wide variety of goals. Whether purchased or sold individually or collectively, options allow investors to profit in falling, rising or even sideways markets. Additionally, options can be used to hedge positions and provide protection from adverse movement in the underlying security. Because options provide a wide exposure to the underlying security, at only a small cost, they also allow investors to take advantage of leverage. In this way, options can yield significantly greater returns than a corresponding investment in the underlying security. 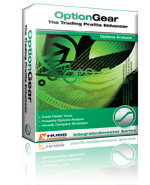 When it comes to options analysis, there is no better tool available than OptionGear software. Take the OptionGear Tour.